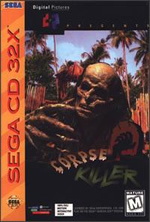 While not breathing much life into this genre, I’d have to say that Corpse Killer is one of the few FMV titles for the Sega CD that had a storyline that just made the cut. Basically, you’re some sort of army pilot whose plane crashed into the ocean, and you’ve managed to jettison from it in time to parachute onto this deserted un-charted island in the middle of nowhere. Once you land, some sort of zombie creature finds you and sinks his venomous voodoo poison into your leg, and thus, you are marked by the curse of the zombie poison. A local Rasta man, named Winston (who some may recognize as Jeremiah Birkett from Seinfeld), manages to kill the zombie off of you and cut you down from your entanglement in the palm tree, and thus the game begins. The game has support for the Sega Menacer, and aside from that option, you may also use the standard D-pad controller, but both options are quite useable. You might find yourself left with the regular controller option, seeing as how much more convenient it is to use, and frankly just how many of us own Menacers anyway? The 32X version has revamped the original Sega CD release with very clean and polished full-motion video. This is a huge benefit for this game, although it’s the only advantage of this version, as all elements of the original have been left unchanged. The game’s story, sappy as it is, reveals itself to you via cut scenes. The cut scenes, however, are merely window dressing spread around the entirety of the gameplay which is simply moving a cursor around the screen and shooting down zombies by the dozens. This is one of Digital Picture’s most infamous formulas and may become very repetitive to some, but they obviously were hoping that you’d be more interested in the movie than the game, as that is clearly where the budget went. Your reward for completing a scene is usually always a remark of congratulations from your friend Winston, or Julie Barnes. Yes, in the midst of this squalid middle-of-nowhere hellhole, you bump into a blond, youthful, hot journalist who wants you to bodyguard her while she takes shots for her story. Rest assured, she is quite hot (played by Bridget Butler). If you’re surprised you’ve never heard of her, don’t be. And the role of the treacherous, spiteful, and sinister Dr. Hellman is none other than great, and late, Vincent Schiavelli, who many know from all sorts of movies like Batman Returns, One Flew Over the Cuckoo’s Nest, Ghost, and Death to Smoochie. Schiavelli takes on the type of character we know him best for: a mentally disturbed freak! I wouldn’t mind the gameplay so much if it didn’t look so disappointing. The backgrounds use full motion video, as well they should, although it slows to a choppy crawl once the action begins. This doesn’t detract from the gameplay, though it just makes it look kind of ugly. The zombies are motion-captured actors in silly costumes and while they’re good for a dry chuckle, they look a bit on the pixelated side and don’t use a whole lot of color. That’s unfortunate, considering that the 32X’s extensive color palette could have possibly been integrated to add to their detail. Despite this, the action is furious and keeps you on your toes, and there is some variety to the gameplay. Some zombies are called Shadow Men and oscillate between white (the good force) and black (evil), so if you shoot them while their color is light, they’ll destroy all the surrounding black magic. In short, they’ll kill all zombies on the screen. Shoot them while they’re black, and you take damage. Your character has ninety-nine hit points and getting hit takes a few or more away. Once they’re gone, it’s game over and back to the beginning. Other zombies, like the Black Magic Strawmen and Reapers, require you to use some other bullets, which are coated with Datura plant cocktail. You always have at least one in reserve by pressing button B while shooting with A. But you’ll need a whole ton of them for later battles to rescue your comrades. Getting these requires going on quests for armor piercing bullets, and then quests for finding datura plants. These quests are simply just playing through more of the same cursor-blasting levels, but ending with Winston saying, “Gotcha primo AP bullets, mon!” or “Datura! Alright!” Once in a while, you’ll get unexpected bonuses in your quests, and get a little more detailed cut scene with some funny interactivity between Winston and Julie, who seem to always quibble. Within the game, you are able to abort any mission at any time and go to your little mobile Datapod unit. On this screen, you have a big selection of cut scenes to choose from which divulge many things about the plot of the game, offering new twists and turns. There are also informational cut scenes about Datura, bullets, weapons, and other things you need to know. This is quite necessary, seeing as how there’s a decent amount of things you need to understand if you hope to beat Corpse Killer. What you need to do to beat this game is rescue all four of your captured comrades by loading up on datura bullets, make it through a vast swarm of zombies, and battle your friends. Yes, Hellman has the power to turn them into zombies and send them after you. But by hitting them with enough voodoo bullets, they’ll transform back and you’ll be that much closer to fighting Hellman himself. Hellman holds the permanent cure to your predicament around his neck, so it’s the ultimate goal to defeat him and take it. In the datapod, you can also make use of a well-appreciated save feature, which will let you save your progress any time you like. Like many FMV games by Digital Pictures, you almost can’t call Corpse Killer a game, but rather a corny, fun-to-watch zombie movie with some interactivity thrown in to keep you interested. I found myself mildly entertained by the gameplay but taken into the story because I love the characters. Their acting ability is not first rate, but they do a great job of portraying their characters well and with the limited amount of cut scene time they have to act, their one-liners and sappy dialogue have a way of making me laugh. Vincent Schiavelli, for example, is a memorable actor. The production value of his cut scenes is superb. The costumes, the zombie henchmen, the scenery, and the eerie music always pleasingly sets the mood for his moments in the spotlight, and I just can’t help but love watching every single one. This is really the reason why I keep playing because as his character comes closer to defeat, he keeps getting angrier and angrier in each scene. He even cops a hilarious line in reference to his character in the movie Ghost. You may dive into Corpse Killer and heavily criticize it. If FMV games pique your interest though, you may be unexpectedly blessed with a fresh new perspective on this genre, and you might just stick it out with a “let’s just see how it ends” attitude. Not an impressive game, and I sure as heck wouldn’t show it to a girlfriend, but a good choice for FMV fans, scarce as they are. Video footage is nice and big improvement over Sega CD without 32X. I say its terrible game. 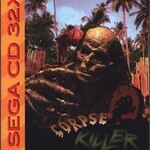 i give this game so many chances to prove otherwise first on sega cd than 32X improved but always hated it. In my opinion one of the worst FMV games out there. I give 1 out of 10. When people hear FMV game, they instantly cringe. It is unfortunate that the genre has become something of a whipping boy of the gaming world. People hate on these games without ever playing them, and the stereotypes perpetuate on the internet. Corpse Killer actually offers up quite a bit of fun. It is one of the first zombie based survival horror games and predates popular titles like Resident Evil. Upon playing through it, it’s easy to see how modern day zombie games like Dead Island or some the more recent Resident Evil titles were influenced by this game. It’s action packed and campy, like a 90’s B movie. As far as FMV games go, this is definitely the best one, and overall is just a fun experience. There’s a lot of island to explore and killing the undead is pretty satisfying. It does what it’s meant to do – it entertains. 7/10 from me.